In most cases it is a statutory requirement that all cranes be tested by a competent person before being taken into service and periodically thereafter. In addition, a further test may be required following any substantial alteration or repair to the crane. It is the purpose of the annual condition inspection to ensure that the overall structural, mechanical, and electric components of the equipment have been maintained in a safe and serviceable condition and are functioning properly according to the original equipment manufacturers specifications. Before any proof load test is carried out, it should be established that the design of the crane allows for the imposition of a proof load and the amount and position at which such load may be handled. It should be noted that the maximum load may be limited by the structural strength of the crane and not by the stability of the machine, in which case a structural failure might occur, e.g. the boom might collapse without warning before the crane starts to tip. 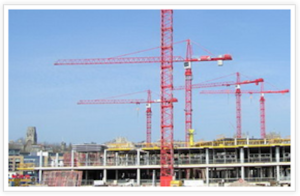 Before a test is carried out reference should be made to manufacturers specifications or an authority experienced in crane design and construction. Due account will then be made for the actual condition of the crane at the time of testing. It should be noted that a proof load test is not the sole criterion for assessing the safe working load of a crane. Most regulations demand a test and thorough examination before first being taken into service, test and thorough examination every four years thereafter, test and thorough examination after substantial modification or repair, and a partial load test and thorough examination annually between proof load tests. While regulations do not always demand the use of a dynamic test load, generally accepted practice is the use of freely suspended loads. 5. High Pedestal Portal Cranes .